Dublin, OH -- The Columbus Marriott Northwest, located in Dublin, OH, managed by Pyramid Hotel Group, has completed its year-long, multi-million dollar renovation. 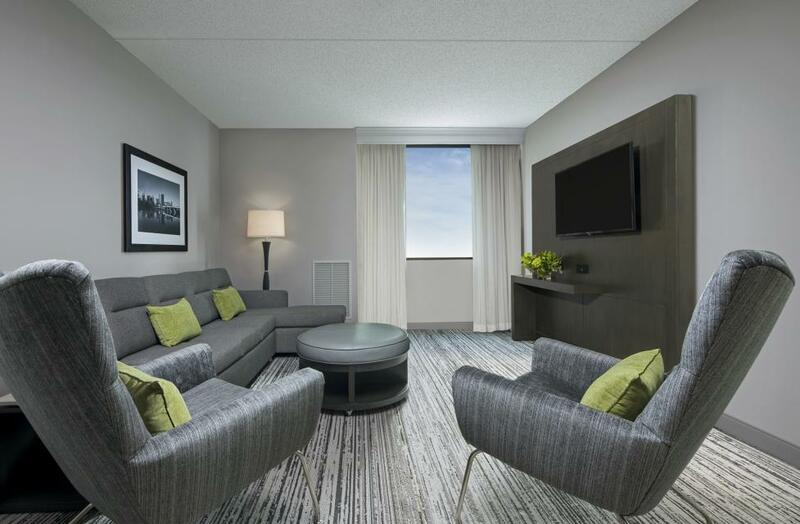 The renovation brings a sophisticated, contemporary style to the hotel’s 304 guest rooms, six suites and 19 meeting rooms, making the hotel the most “Marriott Modern” hotel in Columbus. The renovations of the distinctive guest rooms, noteworthy first floor amenities, breathtaking lobby, and multi-purpose Great Room, as well as the addition of the exclusive M Club and Two Brother Bar & Kitchen has positioned the hotel as the premier meeting destination in Dublin, boasting over 13,000 sq. ft. of meeting space. The hotel has moved away from the red and gold color scheme, and replaced it with grays, greens and neutral tones. They have created a more open environment with contemporary furniture, carpet and new wall covering and paint colors. In addition, the lobby features a chic chandelier, composed of gears and sprockets, which is the focal point of the public space. Newly renovated, contemporary guest rooms are complete with new furniture, fixtures, and 49 inch SMART televisions so that guests can connect using their own video streaming accounts, including Netflix, Hulu, Crackle, Pandora, YouTube and TED/Marriott. The rooms also include mini-fridges and a laptop safe to provide additional comfort and peace of mind. Each room was transformed to create a modern and refined atmosphere that elicits relaxation while also serving as a functional work space complete with technology to stay plugged in and fully charged. The redesigned Guest Rooms now also include a walk-in shower with spa-like rainfall showerheads to add to the rejuvenating experience. A luxurious new bedding package allows guests to enjoy a restful experience and awake refreshed to start a new day. Marriott’s rejuvenated version of the concierge lounge, M Club is now centrally located on the first floor so guests can enjoy the benefits while still feeling a part of the hotel community. This exclusive club provides the ideal space to work, recharge, connect and relax, with the convenience of snacks, drinks and a variety of food options. The M Club Lounge is available for use by Platinum and Gold Marriott Rewards Travelers. Non-reward members will have the opportunity to upgrade their hotel room package to include the M Club benefits. A newly reinvented Marriott Great Room features flexible seating pods, communal tables, and spaces with up-to-date style and design, as well as multiple charging stations so that guests may stay connected. The Great Room is the ideal space to reserve for a gathering and is also the perfect spot to kick back, get reacquainted with friends and family, and enjoy one of the many Starbucks® coffee favorites from our coffee bar. This unique new restaurant and bar offers both a revamped look as well as an entirely redesigned Dublin inspired menu, prepared by Chef Tyler Tremaine. The menu includes flat breads, salads, rice bowls and both small and large plates; perfect to share with friends and family. Two Brother Bar & Kitchen serves delicious craft cocktails and has 10 tasty beers on tap. The restaurant is open for breakfast, lunch and dinner. Marriott’s new room service dining concept that focuses on sourcing local, regional and artisan products that can be served throughout the day and night. This menu includes a culinary array of cuisine that is delivered “to-go” style right to your guest room door. To learn more or make a reservation, visit www.columbusmarriottnorthwest.com or call (614) 791-1000. The hotel has numerous meeting rooms of different sizes and offers more than 13,000 square feet of flexible, state-of-the-art Marriott meeting space. Dublin Ballroom offers a total of 6,577 square feet of meeting space and seats up to 728 guests, including ten professionally appointed, flexible boardrooms and 18 event rooms. These spaces include state-of-the-art technology, onsite audiovisual, high-speed wired/wireless Internet in meeting rooms. Columbus Marriott Northwest is located in Dublin, an upscale suburb of Columbus, Ohio near Muirfield Village Golf Club, Columbus Zoo, and across from Tuttle Crossing Mall. The hotel is ideal for families, groups, and business travelers and is walking distance to many unique dining options and shopping. Pyramid Hotel Group is a privately held, Boston-based hotel company along with its affiliate Winegardner & Hammons Hotel Group based Cincinnati OH have over 100 hotels and resorts under hotel management and asset management, comprising more than 22,000-plus rooms and over 10,000 employees. Pyramid Hotel Group, ranked among the largest U.S. hotel management companies by independent sources, provides hotel management, asset management and project management services to a broad array of hotel assets ranging from a 90-room select-service hotel to world-class properties with more than 800 rooms. Pyramid Hotel Group is a franchisee of all major hotel brand companies and an operator of independent four- and five-star hotels and resorts. Additional information is available at www.pyramidhotelgroup.com.